Compiler: Chen, Shi-wen, et al. 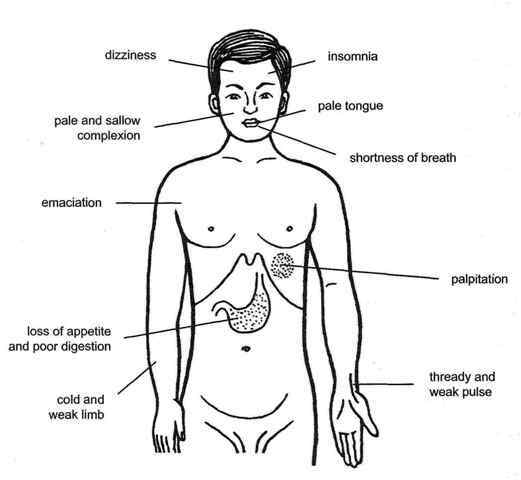 Traditional: Qi and blood deficiency marked by a low energy level, shortness of breath, palpitation, insomnia, dizziness, poor appetite, chronic cough, weak and cold limbs, pale and sallow complexion, emaciation, heavy menstrual bleeding, chronic ulceration, a pale tongue, and a thready and weak pulse. Modern: Debility following illness, childbirth, or surgery; anemia due to excessive bleeding; cancer; side effects due to chemotherapy or radiation; chronic atrophic gastritis; gastroptosis; leukopenia; Sheehan's syndrome; Meniere's disease; and hypoalbuminemia.